Grandmother and Grandad Spess’s first house was in the basin outside of The ‘Ford. I’ve always been disappointed that it wasn’t made of logs, like the house where Grandad grew up. which was probably better building material, easier to build, and I’m sure it was easier to get and haul the materials. These are my dad’s parents and his two oldest brothers. 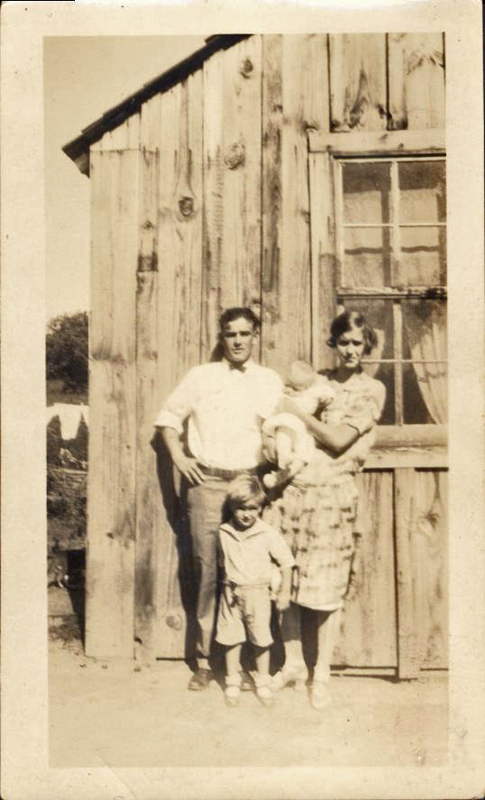 Uncle Paul (the baby in Grandmother’s arms) was born when Frank was two, after G & G had been married two years, so counting on my fingers and toes, I’m thinking this picture was taken in the summer of 1926. That makes Grandad twenty six and Grandmother twenty one. Aren’t they cute? I’m sure Grandmother was never a flapper, but her dress, shoes and hair all tell what era it is. Men aren’t as easy to date by their clothes. Very near this house is a spring. I don’t know if they carried their water from there or if they had a way to pump it. Below the spring today is the catfish pond. I loved fishing there as a kid. 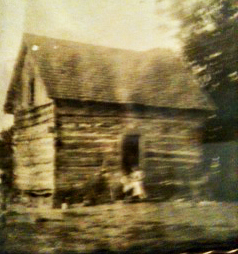 The house had fallen down by the time I was big enough to notice, but I remember seeing the old wood lying in the dirt. 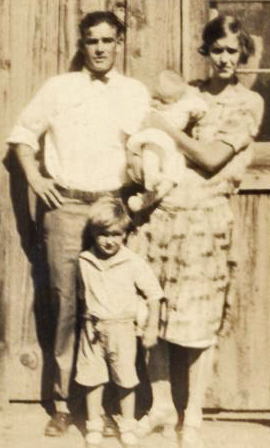 The little boy is Uncle Frank. Isn’t it cute the way his socks bag on top of his shoes? 😉 I didn’t realize how much his grandchildren look like him until I saw this pictures. Today this little boy is a great-grandfather and lives just a little way from where this picture was taken. By the time they passed away, G & G had four children (Frank, Paul, Phyllis and Carol) and nineteen grandchildren. I don’t know if anyone has ever calculate the number of great-grandchildren. Categories: Small World Family | Tags: Calvin Coolidge, Grandmother, Grandparent, Great Depression, Martin E. Trapp, Oklahoma, United States | Permalink.